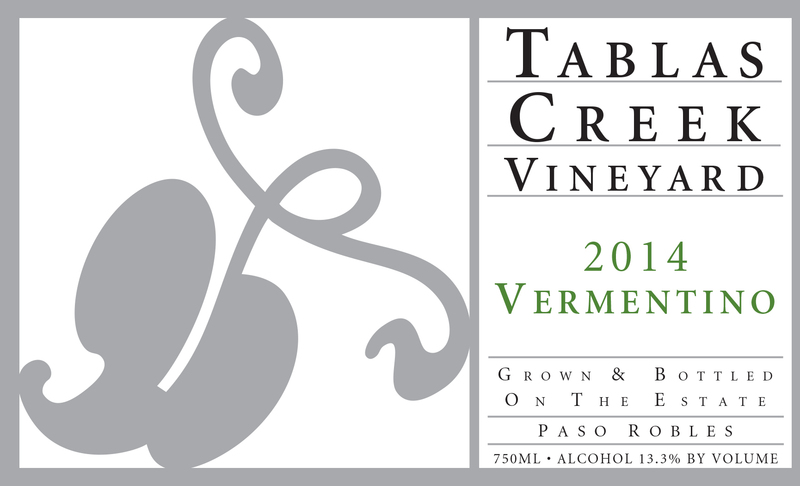 The 2014 Tablas Creek Vineyard Vermentino is Tablas Creek’s thirteenth bottling of this traditional Mediterranean varietal, known principally in Sardinia, Corsica, and Northern Italy. It is also grown in the Rhone Valley (particularly Côtes de Provence) where it is known as Rolle. The Vermentino grape produces wines that are bright, clean, and crisp, with distinctive citrus character, refreshing acidity and surprising richness. The 2014 Vermentino shows a classic chalky, citrus leaf Vermentino nose, but is surprisingly mouth-filling, long and creamy, with lots of great savory flavors of citrus pith, saline and wet stone. Great acids on the finish. Drink now and over the next few years. The 2014 vintage was our third consecutive drought year and a warm spring saw our earliest-ever beginning to the growing season. The summer was warm but without serious heat spikes, and our coolest August in a decade slowed ripening at a critical period. When it warmed back up in September, the fruit tumbled in, and we finished in mid-October, about two weeks earlier than normal. The result was a vintage with excellent concentration balanced by good freshness, which should be vibrant and powerful young, but with the balance to age. The Vermentino grapes were whole cluster pressed, and fermented using native yeasts in stainless steel to emphasize the minerality of the grapes. The wine was bottled in February 2015.